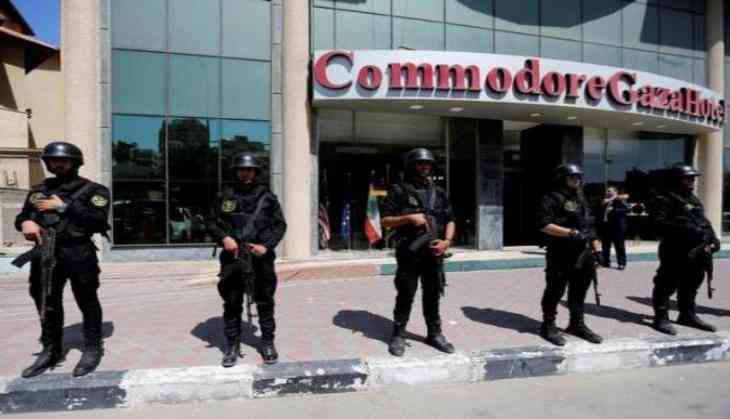 A delegation from the Palestinian resistance group Hamas is in Cairo for talks with Egyptian officials to discuss the humanitarian situation in the besieged Gaza Strip as well as Egypt's role in alleviating the siege. The delegation headed by Hamas' political bureau leader in Gaza , Yahya al-Senwar and Gaza's Deputy Minister of Interior Tawfik Abu Naim left through the Rafah crossing, which was open on 4 June for the group to cross, Anadolu news agency reported. The border is mostly closed for the residents of Gaza as a part of an Israeli and Egyptian blockade. "The delegation that includes Rawhi Mushtaha and Tawfiq Abu Naim, head of the security services in Gaza, will have extensive discussions on relations with Egypt, the blockade imposed on Gaza and Palestine's political issues," Anadolu news agency quoted Hazem Qassem, the Gaza-based spokesman for Hamas as saying. During the visit, which will be the first for al-Senwar since his February leadership victory, the Hamas officials are also expected to meet Egyptian intelligence officials. Ties between Hamas and Egypt deteriorated as the Islamic movement's enjoyed good relations with former Egyptian President Mohammed Morsi, who was ousted in 2013. Recently, Hamas leader Ismail Haniyeh met with Egyptian officials in Cairo to discuss ways to improve the strained relations. Gaza based Palestinian Islamist movement Hamas elected Ismail Haniya as its new political chief in May 2017 replacing Qatar based veteran Khaled Meshaal.Hamas had even released its new policy document last week accepting the establishment of a Palestinian state based on 1967 lines.